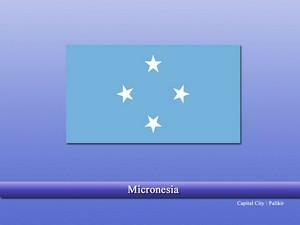 The Federated States of Micronesia, or simply Micronesia is an island nation located in the Pacific Ocean. The country consists of four states i.e. Chuuk, Yap, Pohnpei, and Kosrae and these states combined, consist of over 600 islands that are spread over the area of 2700 km. The islands are known for fresh beaches, ancient ruins, lagoons, scuba diving, boating, and fishing. Indigenous tribes inhabited the island before the colonists arrive. It is estimated that these people arrived on the island around 4000 years ago. The islands were first discovered by the Portuguese followed by the Spanish who made permanent settlements. After, the Spanish power declined after their defeat in the “Spanish-American War”, the islands were sold to the Empire of Japan by the end of the 20th century. The German reign didn’t last long and the islands were soon occupied by Japan in the World War 1. The United Nations also authorized the Japanese to administrate the islands. The Japanese built some of the most crucial bases on the island in World War 2 due to its strategic location and were used for various supplying, etc. operations. A large part of the Japanese fleet was also held on the island when the Americans attacked. As the war ended, the islands were taken by the US who continued their rule till 1979, when the islands were allowed self-governance. The islands are the best destination to be visited in the Pacific Ocean if you are willing to explore the nature and history combined. For nature and beauty, we can’t describe how beautiful and fresh the islands are and in addition, there are various World War 2 remains, sunken ships, etc. that make the place more interesting. The economy of the islands, due to various factors is not well developed and the country is largely dependent on the US aid. Agriculture, fishing, tourism, etc. are some of the economic activities but are not much developed to carry its own burden. English is the official language of the country while several other languages are also being spoken in the country. Christianity was introduced on the islands by the colonists and still today, it is the dominant religion of the island nation. Is basement good for business?